Sundial Moto Sports • View topic - Last Suzuki GS model with points ? 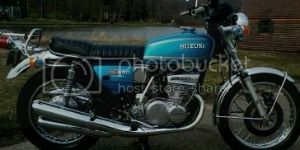 Post subject: Last Suzuki GS model with points ? Whats was the last Suzuki GS model with points ? I wonder, because I own a 87 GS 450 L and that model had an ignition CDI / ignitor change after the 82 model I believe ? Was that related to points or not ? What did the ignition ecu / ignitor replace ? The points system ? Post subject: Re: Last Suzuki GS model with points ? I had a 1978 GS750L and it had points but I believe it was the final year for points, then they went to an acronym called PIE or something but I think it was an inductive iggy system. I bought mine because it was next to nothing but in brand new condition....my favorite day with it was the 50 mile backbreaking ride to the new owners house. I never understood why people liked that handlebar bend. Couldn't agree more. When I bought my 450 it had those bars. I believe they are called buck horn bars or something similar to that. The most uncomfortable pair of bars I've ever experienced. Put you in a position as if you have a board stuck up your rear end. Changed those immediately. I had a 1979 GS750 that was points. It was my father's and I got it when he bought his '79 GS1000E used. Which that one had electronic ignition. They first switch to an electronic ignition with a mechanical advance & later switch to one with an electronic advance. Dynatek sells replacement ignition systems for the mechanical advance bikes. It replaces the ignitor & pickups. Are you thinking about getting a GS? No, I already have one. Some time ago, I was having starting issues with it. There were times it would start and other times it wouldn't. I addressed every damn part, electrical connection on the bike for sometime without making leeway. Around this time, I started this thread as it was related. But, now I can't remember how, lol ! I think it was in reference to the ignition pick ups. Anyways, the bike is no longer giving me problems. Ignition & alternator problems are common on those bikes.